I rewrote the programs again, tweaking the curves and re-thinking the algorithm. 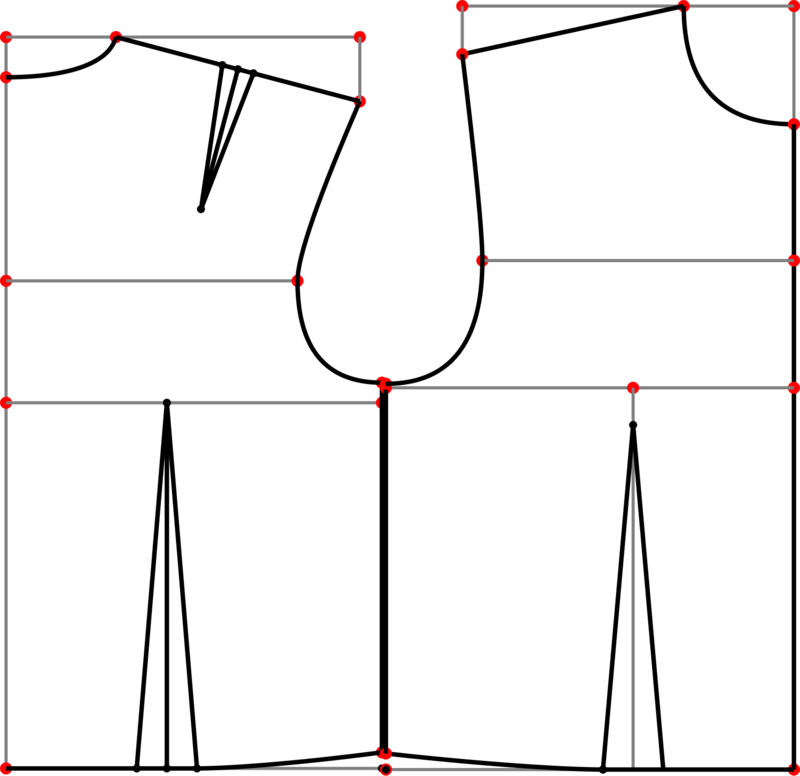 Posted in Design, Inkscape, Python, SVG	| Tagged inkscape, pattern making, python, svg	| Comments Off on Front Bodice Block done! The Back Bodice Block Pattern is done. Must remove reference lines, pretty it up and give it a nice bouncy shine. Commented code as I went along because I remember nothing from day to day. Three months ago I had never written any object oriented code, and never used illustration software. 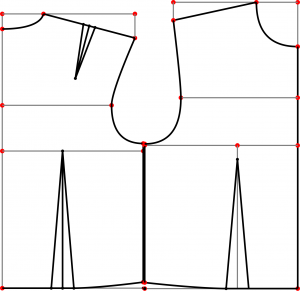 Now I’ve hit this milestone – the Back Bodice pattern block. I will try to post the files on the wiki tonight while catching up on Xena, maybe a re-viewing of ZardOz. All the guys are out of the house. It’s just me and the sherbert (uh, sorbet?) between now and Sunday afternoon. I honor and revere my slack. It’s the source of my super powers. Simultaneous solving of equations – who knew it would come to this? Oh yeah. I had a shoulder line with a slope. Needed to make a dart perpendicular to shoulder line at the midpoint. Aha! Get slope of shoulder line, negate & invert to get perpendicular slope. Use midpoint as center point of circle. Solve line and circle equations simultaneously. My issues were that python doesn’t like ^ for exponents, likes ** instead. Use as many parentheses as you can possibly stand, didn’t get the right results with r / (1+m**2)**(1/2) . This was changed to (r/((1+m**2)**(.5))) and it worked perfectly. And did you notice my Quadratic Bezier Curve? 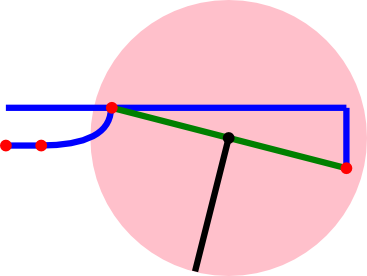 I’ve been struggling with creating bezier curves in an Inkscape SVG drawing from within a custom Inkscape extension written in Python. It turns out that it’s the formatting of the element call that was the problem. Here’s what worked for me – This is a simple example. I’ve included only one control point between the two end points. 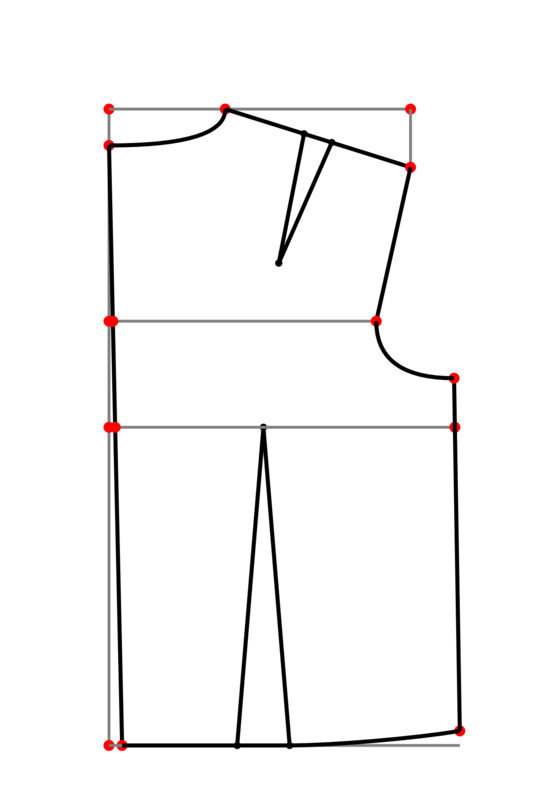 The first coord (x1,y1) in mypathattribs is the begin point and is designated by M to move the pen to that point, the last coord (x2,y2) is the end point and doesn’t require a designated label, and the control point in the middle (c1,c2) is designated by Q. My wordpress template isn’t allowing me to have specific line indents, so if you cut and paste you’ll need to add indents for the lines within DrawQCurve. Converting the numbers to string and storing them in variables and putting the variables in the mypathattribs didn’t work, although this method works with other SubElement calls. Placing the style information after the path definition was required as well, again this is different than with other SubElement calls. For some reason, I had to specify that the stroke-width was in pixels. I received error messages when ‘stroke-width’:’15’ was in mypathstyle, but didn’t for ‘stroke-width’:’15px’ . And again, this is different than with other SubElement calls. And appending ‘in’ for inches in the coordinate strings didn’t work even though it works for other calls, so I multiplied by 90 (90px per inch is default in Inkscape) to convert inches to pixels- I left this out because it wasn’t necessary for the example. The previous great SVG learning site that I blogged about earlier was out of date in 2009. The current version is at the W3 site. It’s been there for some time. And it’s still the best I’ve found. It appears that SVG is a bit like Erector sets. It’s actually pretty simple, but with SVG/Python/Inkscape so many people have done so many complicated things with it, that it ain’t easy to peel back the layers to learn how to start building from scratch. It’s hard to find source data that reveals the foundational information on building SVG in a way that doesn’t follow the ‘example 1, example 2, that’s enough info you don’t need to know where the extra information in those examples came from or why they were necessary to make this work’ formula. This blog is a journal about my experience in learning to program. And about my experience in creating open source fashion design software using Python, SVG and Inkscape. Exciting for the world, eh? I’m trying to document how through lots of work I can find tiny a bit of basic info here and a tiny bit elsewhere. It’s slow. Very very slow. Yeah, it’s official. I’ve created a template for patterns which is based on pixels. The units for creating or editing an object within an extension can be changed to inches or centimeters by appending ‘in’, ‘cm’ or ‘px’ to the measurement specified in the create element call. This doesn’t change the base unit of the document, will just need a global var in first extension or put a database lookup in each extention to specify the client’s measurement choice. This actually makes it easier to make changes per client. Metric is preferable because smaller units results in greater accuracy — but it’s tough for me in the US to find sewing notions in centimeters so I’m fairly stuck with inches. But the program will allow for both so that clients can use the measurement they prefer. Found a great site which seems very promising in explaining how to control the results of the path command. An SVG Primer for Today’s Browsers by David Daily. My main wiki page has been ravaged and sacked. Small annoyance: I haven’t found a way to change Inkscape unit settings from within an extension. 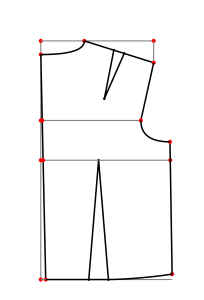 Each extension must convert centimeters and inches to pixels so that any pattern design is modified consistently with either measurement system. I found a newly developed library that I think will make creating objects in Inkscape a lot easier: pySVG – http://codeboje.de/pysvg/ . Just found some great documentation at /usr/share/pySVG/doc/html/genindex.html that provides an index of the api which link to further documentation. This will help someone like me, a non-programmer, utilize this library. BTW – the two books I ordered are *not* for beginners. I can’t scan the pages and pick up info, these books have to be read. They’re textbooks. But I don’t see them being textbooks to teach young people how to program. Ordered two programming books today. Inkscape tutorial – pen of Sequins! Holy cow! check this out. It’s a tutorial at Very Simple Designs how to design a line of sequins. How to turn it into an extension using pattern-along-path feature to easily create a line or curve of sequins? This extension could be the foundation for many decorative aspects of design. Well done tutorial. Posted in Uncategorized	| Comments Off on Inkscape tutorial – pen of Sequins! Prairie vole, museum curate, or video game fodder? I’ve been thinking about some of the reasons which motivate my efforts in producing this product. Some of it has to be the joy of sharing. The ability to feel joy while sharing knowledge is probably a bit like a person’s ability to pair bond. Either one’s genes are expressed to enable an outpouring of oxytocin and vasopressin , or they aren’t. But whereas the majority of the world’s population carry genetic material for pair bonding, it seems like a minority have the genes for the joy of sharing. Hoarding knowledge? Not for me. I feel like a cross between a tent-revival preacher and a prairie vole of sewing techniques. At a more dry level which doesn’t necessarily involve sharing of bodily fluids, translating traditional design techniques into software provides documentation, preservation and accessibility to the old ways via a new media. Like a museum-on-demand along with a fully functional take-home kit. Sparking new life into something that simply wasn’t moving, perhaps to die like a shark in stasis. But on the other hand, the life of this project in my head could turn out to be like a video game where my miscalculations have me wandering towards the dead end of a maze, naively believing that I can evade the never-ending hunger and persistence of Ms. Pac-man to eventually track me down. Posted in Uncategorized	| Comments Off on Prairie vole, museum curate, or video game fodder?